Why? Little word, big question. Anyone who’s been around a toddler knows how complicated life gets when we start to ask why. In the context of grief, the question of “why” can be one of the most infuriating thoughts that you come back to again and again. The first challenge of “why” is that you have to figure out who you’re asking. If you have a strong religious faith the answer to this is probably obvious to you, but that adds a whole other set of complications, like “why would God let this happen?” If you’re generally spiritual, agnostic, or atheistic you may find there’s no specific place for your question to land which can lead to a frustrating exercise in logic often leaving you wondering at the purpose of existence in its entirety. Either of these circumstances create an incredibly heavy burden to bear. 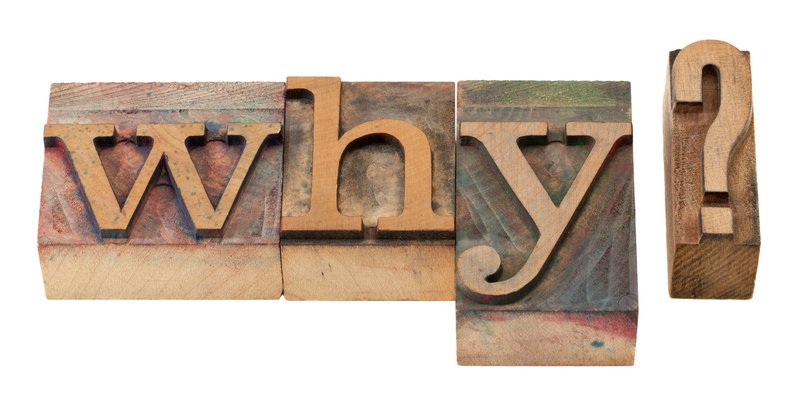 The second challenge of “why” is, if you knew why would it make a difference? Let’s say hypothetically you could get an answer to why they died. Would any reason be good enough? Would you ever think, “sure that explanation justifies my loved one dying”? Would knowing why make you miss them less in those moments when you want to hug them or call them on the phone? Probably not. Which leads to the third challenge of “why”; death defies explanation. We have no idea why one child develops cancer and their sibling doesn’t, or why someone is just in the wrong place at the wrong time, or why some people can battle back addiction while others can’t. When it comes to death and grief there is never a definitive answer to the question of why. Being that we’re intelligent, curious, logical creatures, not having an answer to something is very difficult for humans to accept. So we wander back to the question of why again and again. The tasks for us here are to understand that we’ll never truly know why they were the one to die, then eventually accept the not-knowing. It’s not what our brains are set up to do, so it will take some work. When you find you mind wandering back to why, take a deep breath and gently remind yourself that there are always going to be things beyond your knowing and this question of why is one of them. Don’t ask why because no explanation would ever be good enough – I find this strangely comforting as it’s a question I’ve been asking myself for the last 4 years – thank you. Truly accepting that there will never be an answer can definitely be comforting. It’s its own sort of resolution.